Homemade almond flour crackers topped with the ever popular Everything But The Bagel Sesame Seasoning blend from Trader Joe’s. 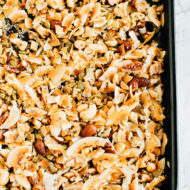 4 simple ingredients, vegan and gluten-free. 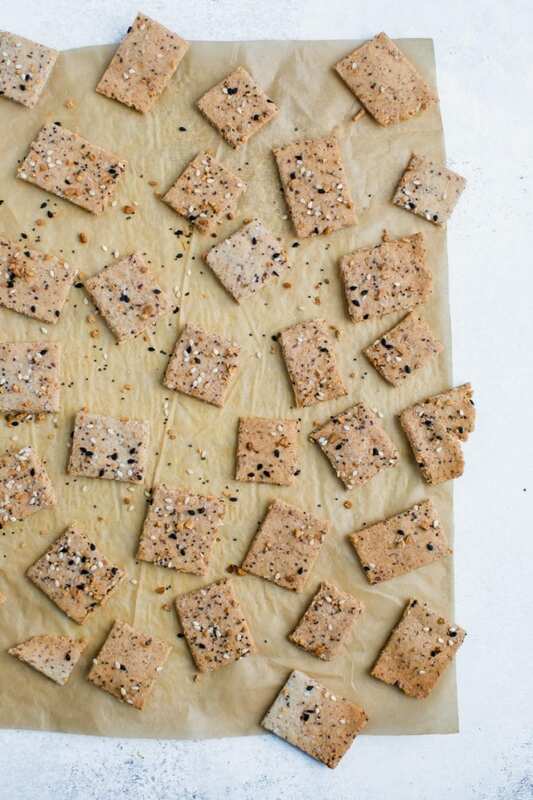 If you haven’t tried making your own crackers, you need to stat! 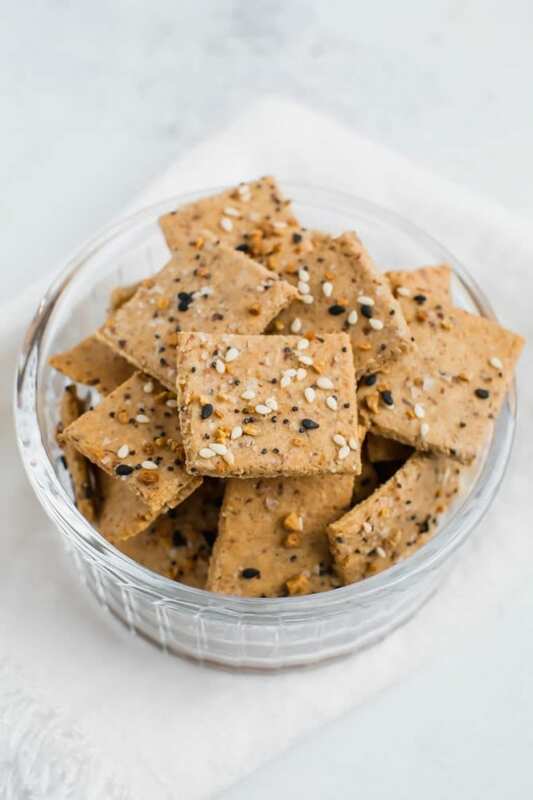 These Everything But The Bagel Crackers are based on my 3-ingredient almond flour crackers that everyone loves, but I decided to add the popular Everything But The Bagel Sesame Seasoning from Trader Joe’s to take them to the next level. And I have to say, this recipe is a winner! 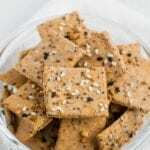 Don’t be intimidated by homemade crackers – they are super simple to make. The base of this recipe is just three ingredients (four if you count water). Start by mixing the almond flour, water, ground flaxseed and sea salt in a large bowl. Stir until a dough forms. Place the dough on a piece of parchment paper and cover with another piece of parchment paper. Pat down the dough a little and then roll out with a rolling pin until the dough is about 1/8″ thick. Try to roll the dough into a rectangular shape but don’t stress too much about it . . . it doesn’t really matter what shape it ends up in. When the dough is rolled out, you’ll sprinkle the Everything But The Bagel Seasoning on top. I buy mine at Trader Joe’s, but I’ve also seen this seasoning at Lidl and you can also make it yourself if you’re feeling ambitious. It’s just a combination of dried spices, seeds and sea salt: dried onions, dried minced garlic, sesame seeds, poppy seeds and sea salt flakes. Use a pizza wheel or knife to cut the dough into small squares. Transfer the parchment paper to a baking sheet and bake until the crackers are golden brown and crispy. Let the crackers cool completely and then store in an airtight container. 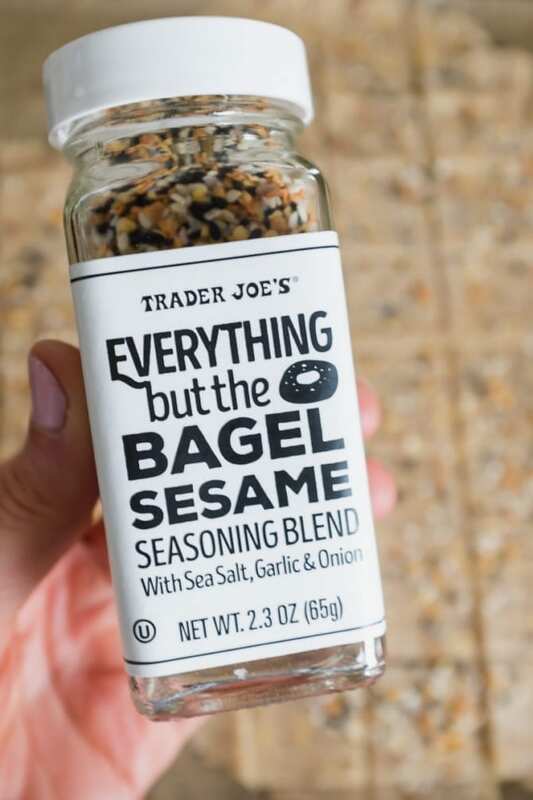 I love the savory flavor the Everything But The Bagel Seasoning adds. I enjoy these crackers on their own, with hummus or guacamole or even with meat and cheese slices. The perfect afternoon snack! If you make these Everything But The Bagel Crackers, be sure to leave a comment and star rating below letting me know how they turn out. Your feedback is super helpful for the EBF team and other EBF readers! Homemade crackers topped with the ever popular Everything But The Bagel Seasoning from Trader Joes. 4 simple ingredients, vegan and gluten-free. Place the dough on a piece of parchment paper. Cover it with a second piece of parchment. Pat it out with your hands and then use a rolling pin to roll out the dough. You’ll want the dough to get pretty thin — about an 1/8 of inch thick. Try to form the dough into a rectangular shape. It’s okay if it’s not perfect. Once the dough is rolled out, remove the top sheet of paper and sprinkle Everything But The Bagel Seasoning over the dough. Use your hands to press the seasoning down to help it stick. With the top sheet of parchment removed, use a pizza wheel or knife to cut the dough into small squares. I made mine about 1/2 -1 inch. If you want to get fancy, you can use a toothpick to create a little hole in the center of each cracker. Let the crackers cool completely, either on the baking sheet or on a cooling rack. Enjoy immediately after cooling. Place any leftover crackers in an airtight bag or container for later. Hi Brittany! 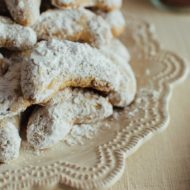 Any suggestions for replacing almond flour since my son is allergic? 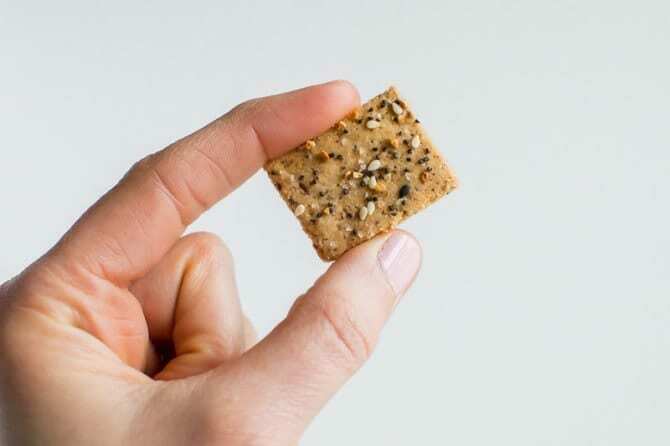 We are making a shift towards all whole foods, so loving the idea of making our own crackers! Thanks! Good question! I haven’t tried this recipe with another except almond flour thus far. I think you could easily make whole wheat crackers as well. 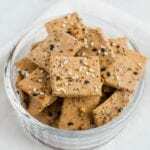 I found this recipe through a quick Google search (https://www.acouplecooks.com/whole-wheat-crackers/). 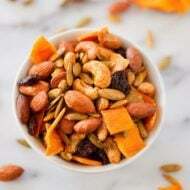 I’ve ground raw hulled sunflower seeds in the blender (mine is a Vitamix but I think any blender would do this) to replace almond meal in a different recipe and it worked perfectly. I buy sunflower seeds from the bulk bins at my local co-op, but I imagine you can find them at Whole Foods and other stores. The sunflower meal comes out finer, less grainy than almond meal, probably more like almond flour. I made something similar but they were nutritional yeast crackers with the everything but the bagel seasoning on top. This is a fantastic food recipe, thank you for the brilliant write up. Can’t wait to try this recipe! This would be great for Passover, except I can’t have flaxseed on the holiday. Can the flaxseed be left out or are you using it as an egg replacement?